This article is part of a paper originally written for a project and conference on "After the Iraq War: Strategic and Political Changes in Europe and the Middle East," co-sponsored by the GLORIA Center and The Military Centre for Strategic Studies (CeMiSS) of Italy. 1980s, phase one: Activity in Pakistan, Saudi Arabia, and the United States. 1990-96, phase two: To work alongside the Islamist revolutionary regime in Sudan to export revolution to Egypt, Algeria, Saudi Arabia, and Eritrea. 1996-2001, phase three: Operations from Afghanistan, as an ally of the Taliban government. The establishment of a Muslim state in the heart of the Islamic world is not an easy or close target. However, it is the hope of the Muslim nation to restore its fallen caliphate and regain its lost glory... We must not despair of the repeated strikes and calamities. We must never lay down our arms no matter how much losses or sacrifices we endure. Let us start again after every strike, even if we had to begin from scratch. It is in this framework that we must see the concentration of al-Qa'ida's operational efforts on the Iraqi front. At the end of 2004, the US State Department assessed that the role of key Islamist groups in Iraq makes it "the central battleground in the global war on terrorism." Since the demise of the Taliban regime and al-Qa'ida "solid base" in Afghanistan three phases can be distinguished in the operational activity of the organization and its affiliates and supporters in the Muslim world: (1) After the demise in Afghanistan, the strategy of destabilizing Muslim countries by attacks against soft targets; (2) after the fall of the Saddam Hussein regime, concentration on the Iraqi arena against the US army and the coalition forces with the hope of a victory on the 1980s Afghanistan model; (3) since the fall of 2004, an extension of the fighting to most of the Middle East, an increased effort in Europe, but the appearance of the first strategic splits in its ranks. The goal of the World Islamic Front (WIF) for the Struggle Against Jews and Crusaders proclaimed by bin Ladin on February 22, 1998 was to form an international alliance of Sunni Islamist organizations, groups, and Muslim clerics sharing a common religious/political ideology and a global strategy of Holy War (jihad). It was replaced in the spring of 2002 by a new name, or perhaps framework-Qa'idat al-Jihad (The Jihad Base)-and WIF virtually disappeared. After the war in Afghanistan and until the Madrid bombings in March 2004, in spite of bin Ladin, al-Zawahiri, and other al-Qa'ida spokes persons' repeated threats to hit devastatingly at the heart of the United States and the Western world, all successful terrorist attacks have targeted Muslim countries (and Muslim communities such as Mombassa, Kenya). Local or regional groups affiliated with al-Qa'ida were primarily responsible for these operations. They include the Salafi factions in Tunisia and Morocco; Yemeni Islamists; or the Indonesian Jemaa Islamiyya (in fact a group led from Indonesia by Abu Bakr Bashir but with Malaysian, Philippine, and Singaporean branches striving to form a new regional Islamic state). It seems that only the suicide bombings in Saudi Arabia in May 2003 were directly related to al-Qa'ida militants. Interestingly, with the exception of Saudi Arabia, the economies of all these countries or communities (Djerba, Bali, Casablanca, Istanbul, Mombassa) are heavily dependent on tourism. The campaign by al-Qa'ida terrorists and associates against Arab and Muslim regimes may be explained by a shift in the ideological and strategic thinking of those Islamists who now occupy the vacuum left by bin Ladin and his deputy. The targeting of the tourist infrastructures calls to mind the strategy of the Egyptian jihadist groups in the mid-1990s. One might speculate that this strategy results from the growing influence of al-Zawahiri, bin Ladin's deputy. Yet this is also the result of the decline in al-Qa'ida's operational capabilities following the quick demise in Afghanistan, the unremitting campaign of harassment against its leaders, and the capture or elimination of many of its central commanders. On February 11, 2003, just before the US-led war in Iraq, bin Ladin distributed two audiocassettes. One addressed the Iraqi people while the other (at 53 minutes his longest to date) was directed to Arab governments and clerics. The main focus of his speech was not the United States, but rather the Arab governments and the Islamic clerics that supported them and gave them legitimacy. The conflict with these Arab governments was presented as eternal and insolvable. Bin Ladin's February 2003 message to the Iraqi people sought to encourage their morale and guide them as to how they should face and defeat the incoming American invasion of their country. In an attempt to convince the Iraqis that the United States was not invincible, bin Ladin explained how he and his followers, numbering only about 300, had frustrated the American action against them at Tora Bora in Afghanistan. He stressed the importance of the Iraqi people fighting united against the Americans, irrespective of whether they were Arabs or non-Arabs (Kurds), Sunnis, or Shi'a. Religious scholars from the Islamic Research Academy at Egypt's al-Azhar university also declared on March 10, 2003 that a US attack on Iraq would require Arabs and Muslims to wage a jihad in Iraq's defense against "a new crusade that targets its land, honor, creed, and homeland." Upon the fall of Baghdad, al-Nida, al-Qa'ida's website posted a series of articles which stated that guerilla warfare was the most powerful weapon Muslims had, the best method to continue the conflict with the "Crusader Enemy." It mentioned that it was with guerilla warfare the Americans were defeated in Vietnam and the Soviets were defeated in Afghanistan, "the method that expelled the direct Crusader colonialism from most of the Muslim lands, with Algeria the most well known." Thus, the scenario for the insurgency and terrorist campaign in Iraq was built already in the weeks and possibly the months before the war, involving an "objective" coalition of ex-Ba'thists and army and intelligence officers, Iraqi Sunni Islamists delivered from Saddam's yoke, Muslim volunteers from Arab and European countries, and with the tacit support of Syria and probably Iran. Due to some major American strategic errors and in spite of the swift and stunning US military campaign in Iraq, this scenario developed into "a continuum of violence and uncertainty": the lack of a quick Iraqi political alternative to the Saddam regime (contrary to what happened in Afghanistan), the disbanding of the regular army and police forces, and the lack of a clear planning for the immediate aftermath of the war. In the words of a known American military analyst, "the US chose a strategy whose post-conflict goals were unrealistic and impossible to achieve, and only planned for the war it wanted to fight and not for the "peace" that was certain to follow." During the summer and fall of 2003, Iraqi insurgents emerged as effective forces with significant popular support in Arab Sunni areas, and developed a steadily more sophisticated mix of tactics. In the process, a native and foreign Islamist extremist threat also developed which deliberately tried to divide Iraq's Sunni Arabs from its Arab Shi'ites, Kurds, and other Iraqi minorities. By the fall of the 2004, this had some elements of a low-level civil war, and by June 2005, it threaten to escalate into a far more serious civil conflict. Iraqi insurgents, terrorists, and extremists exploited the media focus on dramatic incidents with high casualties and high publicity. They created "alliances of convenience and informal networks with other groups to attack the United States, various elements of the Iraqi Interim Government and elected government, and efforts at nation building." Then insurgents increasingly focused on Iraqi government targets, as well as Iraqi military, police, and security forces and tried to prevent Sunnis from participating in the new government, and to cause growing tension and conflict between Sunnis and Shi'a, and Arabs and Kurds. By May 2005, this began to provoke Shi'a reprisals, in spite of efforts to avoid this by Shi'a leaders, contributing further to the problems in establishing a legitimate government and national forces. Although from the beginning of the war and its immediate aftermath many Islamist groups were involved in the fighting against the US and coalition forces, the Jordanian-Palestinian terrorist Abu Musab al-Zarqawi was considered to be the most dangerous leader of the most dangerous group connected with al-Qa'ida. He was presented by the US and Western intelligence agencies as the former director of a training camp in Afghanistan and a close associate of Usama bin Ladin. He was believed to have escaped to Iraq during the US invasion. He was reportedly in Baghdad from May-July 2002 to undergo medical treatment, while establishing a network of approximately two dozen members who moved about freely throughout Baghdad for over eight months, primarily conducting transfers of money and materials. He coordinated terrorist activities in the Middle East, Western Europe, and Russia from his base in Iraq, and his connections stretched as far as Chechnya and the Pankisi Gorge in Georgia. Al-Zarqawi was considered to be the leader of the terrorist group al-Tawhid, which first gained public attention in Germany when a number of its members were arrested in that country in April 2002. Zarqawi was also presented as the leader of the Arab contingent within Ansar al-Islam linked to al-Qa'ida plots in Jordan during the millennium celebration, as well as to attempts to spread the biological agent ricin in London and possibly other places in Europe. At some point, most likely after the occupation of Iraq in April 2003, he split from Ansar al-Islam and created his own organization, which he called al-Tawheed wal Jihad (Monotheism and Jihad). This organization first came to world attention when US citizen Nicholas Berg was beheaded in April 2004, allegedly by Zarqawi himself, and the event was videotaped and posted on Islamist websites. Al-Tawheed wal-Jihad lacked a solid base of operation, and therefore the group decided to use Fallujah as "a safe haven and a strong shield for the people of Islam-'the Republic of Al-Zarqawi.'" The radical Sunni Islamist insurgents, like those belonging to the Zarqawi group, called also "neo-Salafis" or "Takfiries", believe they are fighting a region-wide war in Iraq to create a Sunni puritan state, a war that extends throughout the world and affects all Arab states and all of Islam. Foreign volunteers are one of the most dangerous aspects of the insurgency involved in the cruelest sectarian terrorist attacks against civilians-mostly suicide bombings, kidnappings, and beheadings. Some clerics and Islamic organizations recruit young Arabs and men from other Islamic countries for Islamist extremist organizations and then infiltrate them into Iraq through countries like Syria. There is the danger that some will probably survive and emerge as new cadres of expert terrorists building a new generation of trained radical young men and jihadists outside the country. Zarqawi's group is composed mostly of non-Iraqi Arab volunteers who originate from countries bordering Iraq-Saudi Arabia, Kuwait, Jordan, and Syria-due to the ease with which jihadists from these countries can infiltrate Iraq. According to some researchers, the multi-national nature of the two groups could also explain the alliance between Zarqawi and bin Ladin. The successes of the Zarqawi group during the two and a half years of terrorist and guerrilla activity and the continuation of their painful strikes against the coalition forces and primarily against the officials and security forces of the new Iraqi government has attracted more and more groups and volunteers to his ranks. Although for a long time he was considered the representative of al-Qa'ida in Iraq, it was only in December 2004 that his allegiance to bin Ladin and al-Qa'ida materialized. This was due to growing strategic and tactical disagreements between the various leaders of the jihadist movements. The disagreements are a result of the need to achieve at any cost a quick visible victory in the fight against the US-Western coalition and its Arab allies and relate to three main issues: (1) With the growing strategic and political status of the Shi'a in Iraq and the potential threat they represent in the entire Gulf area, the Shi'a have been designated as the Sunni jihadist movement's main enemy. (2) The growing number of innocent Muslims killed in terrorist attacks due to the increasing violence in Iraq and Saudi Arabia, have produced negative reactions among Arab public opinion and the need to delineate tactical "red lines." (3) With the beginning of the terrorist jihadist activity in Saudi Arabia in May 2003, there has become a need to define the main struggle front-Iraq, Saudi Arabia, or possibly Egypt. The need to score a strategic victory on the Iraqi and Middle Eastern fronts, to attract greater participation of new young levees in the struggle, and solidarity from the Arab masses have also pushed the jihadist leaders to bandwagon the Palestinian intifada and to increase their operational efforts in Europe in the hope of disrupting the US coalition. From the September 2003 assassination of Ayatollah al-Hakim and to present, Zarqawi has made the utmost effort to provoke the Shi'a of Iraq to retaliate against the Sunnis and thus trigger a civil war. This strategy, reflecting the common Wahhabi doctrine, became obvious after US authorities leaked a letter written by him in January 2004. The Shi'a were described as "the most evil of mankind...the lurking snake, the crafty and malicious scorpion, the spying enemy, and the penetrating venom." Their crime was "patent polytheism, worshipping at graves, and circumambulating shrines." Zarqawi's position contradicted bin Ladin and al-Qa'ida's views concerning the Shi'a. It should be noted that in his audio message of February 2003, bin Ladin stressed the importance of the Sunnis and Shi'a fighting united against the Americans. He even cited Hizballah's 1983 suicide bombing of the US Marine barracks in Beirut as the first "American defeat" at the hands of Islamist radicals. The victorious image in the Arab and Muslim world achieved by the Shi'a Hizballah movement and its leader Hasan Nasrallah after the Israeli unilateral withdrawal from southern Lebanon in May 2000 and, more recently, the exchange of prisoners (including many Palestinians) between Israel and Hizballah in January 2004, created much resentment and criticism in Saudi jihadi-Salafi elements. Moreover, the presentation of Nasrallah as the "New Salah al-Din" put the role of the global vanguard of Islam played by Qa'idat al-Jihad at risk for a takeover by the Hizballah. Since the process of establishing a new government in Iraq, with a clear Shi'a majority, Salafi web sites and forums have stepped up their attacks against the Shi'a, Iran, and Shi'a doctrines. It is interesting to note that it was bin Ladin who accepted the strategy of Zarqawi and the Saudi jihadists, recognizing the predominance of the leaders who continued the fight on the ground rather than that of the nominal leadership which was hiding somewhere in Pakistan. This process took a whole year and resulted in the nomination of Zarqawi as the "emir" of al-Qa'ida in Iraq. Bin Ladin did not respond to Zarqawi's first letter sent to him in December 2003 (the one leaked in January 2004 by the Americans). On October 17, 2004, "with the advent of the month of Ramadan and the need for Muslims to unify ranks in the face of the enemy," Zarqawi announced that "Tawhid and Jihad Group, its prince and soldiers, have pledged allegiance to the shaykh of the mujahideen Usama bin Ladin." He changed the name of his organization from al-Tawheed wal Jihad to Tandhim Qa'idat al-Jihad fi bilad al-Rafidain (The al-Qa'ida Jihad Organization in the Land of the Two Rivers). Interestingly, the announcement mentioned that "[t]here have been contacts between Shaykh Abu Musab al-Zarqawi_with the brothers in Al-Qaida for 8 months," but "a catastrophic dispute occurred." The contacts resumed, however, and in the end, "the brothers from Al-Qaida" understood "the strategy of the Tawheed wal-Jihad Movement in Mesopotamia..." and "their hearts" were "pleased by the methods [al-Zarqawi] used." Al-Qa'ida indeed reprinted and acknowledged the statement, responding favorably to the new development in their online magazine Mu'askar al-Battar. On December 27, 2004, bin Ladin designated "honored comrade Abu Mus'ab al-Zarqawi" as the "commander [Amir] of al-Qaida organization in the land of the Tigris and the Euphrates," and asked "the comrades in the organization" to obey him. In a video aired on al-Jazeera, in what appears to be a response to Grand Ayatollah Ali al-Sistani's call on his Shi'a followers to vote en masse and decree that those who boycott the elections are "infidels," bin Ladin warned against the participation in elections: "Anyone who participates in these elections_ has committed apostasy against Allah." He also endorsed the killing of security people "in Allah's name." However, this important issue has continued to trouble the relations between the al-Qa'ida leadership and al-Zarqawi, as evidenced in the letter sent to the latter by Ayman al-Zawahiri in July 2005. In this major document Zawahiri acknowledges "the extent of danger to Islam of the Twelve'er school of Shiism... a religious school based on excess and falsehood," and "their current reality of connivance with the Crusaders." He admits that the "collision between any state based on the model of prophecy with the Shi'a is a matter that will happen sooner or later." The question he and "mujahedeen circles" ask Zarqawi is "about the correctness of this conflict with the Shi'a at this time. Is it something that is unavoidable? Or, is it something can be put off until the force of the mujahed movement in Iraq gets stronger?" Moreover, Zawahiri reminds Zarqawi that "more than one hundred prisoners-many of whom are from the leadership who are wanted in their countries-[are] in the custody of the Iranians." The attacks against the Shi'a in Iraq could compel "the Iranians to take counter measures." Actually, al-Qa'ida "and the Iranians need to refrain from harming each other at this time in which the Americans are targeting" them. This is indeed a new kind of real-politik on the part of al-Qa'ida leadership. The jihadist fighters in Iraq were enraged when in July 2004 Abu Muhammad al-Maqdisi, Zarqawi's former prison mentor, posted an article on his website criticizing "blowing up cars or setting roadside explosives, by firing mortars in the streets and marketplaces, and other places where Muslims congregate." Al-Maqdisi stated that the "hands of the Jihad fighters must remain clean so that they will not be stained by the blood of those who must not be harmed even if they are rebellious and shameless," and warned against attacks on Christian churches, as this would strengthen the will of the infidels against Muslims everywhere. A year later, al-Maqdisi criticized "the extensive use of suicide operations" in which many Muslims were being killed and expressed reservations about the extensive killing of Shi'a in Iraq. Moreover, he opposed declaring the Shi'a as non-Muslims, which in effect permitted their blood. In a 90-minute audio recording released in May 2005, Zarqawi relied on Muslim jurists to justify and legitimize the collateral killing of Muslims in the act of killing infidels, as the evil of heresy is greater than the evil of collateral killing of Muslims. In the same recording, Zarqawi announced the beheading of the chief of intelligence of the Shi'a Badr, "the brigade of perfidy, the brigade of apostasy and the brigade of agents for Jews and Crusaders." Some Islamist Saudi writers, such as Abd al-Rahman ibn Salem al-Shammari, also praised the beheading of captives. This then became one of Zarqawi's preferred tactics in his attempts to threaten and expulse the foreign presence in Iraq, and he was proudly named the "Shaykh of the Slaughterers." In a July 2005 audiotape, Zarqawi claimed that it was a duty to wage jihad against the Shi'a, because they were apostates (murtadoon) and had formed an alliance with the Crusaders against the jihad fighters. In July 2005, Zarqawi published a third statement in which he rejected al-Maqdisi's accusations and attacked him, saying that ulama who were not participating in the jihad in Iraq had no right to criticize the actions of the fighters, thereby even serving Crusader interests. A small number of Sunni shaykhs and organizations urged Zarqawi to withdraw his anti-Shi'a statements on the grounds that they ignite fitna (internal strife), thus serving the interests of the occupation. So did the Association of Muslim Scholars in Iraq, the Mufti of Saudi Arabia, Shaykh Abd al-Aziz al-Shaykh, and the Syrian Islamist Shaykh Abd al-Mun'im Mustafa Halimah. Moreover, five "resistance organizations"-the Army of Muhammad, al-Qa'qa Brigades, the Islamic Army in Iraq, the Army of Jihad Fighters in Iraq, and the Salah al-Din Brigades-stated that "the call to kill all Shi'ites is like a fire consuming the Iraqi people, Sunnis and Shi'ites alike" and proclaimed that the resistance targeted only Iraqis "connected to the occupation." Define the Main Struggle Front: Iraq, Saudi Arabia, Egypt? Throughout bin Ladin's public statements and declarations runs one fundamental and predominant strategic goal: the expulsion of the American presence-both military and civilian-from Saudi Arabia and the entire Gulf region. According to Cordesman and Obaid, Saudi Arabia only began to experience serious internal security problems when bin Ladin and al-Qa'ida actively turned against the monarchy in the mid-1990s and began to launch terrorist attacks in an effort to destroy it. However, these attacks remained sporadic until May 2003 when cells affiliated with al-Qa'ida began an active terror campaign directed both at foreigners-especially Americans-and the regime. This analysis does not explain why al-Qa'ida did not anything serious to attack its major target and the loathed Saudi royal regime until after its demise in Afghanistan. It seems more realistic to evaluate that there was a kind of unwritten agreement between the Saudi rulers and bin Ladin not to touch Saudi interests and soil. This could also explain why Saudi Arabia was one of the only three countries (with Pakistan and the UAE) that recognized the legitimacy of the Taliban regime in Afghanistan, supported it financially, and maintained diplomatic relations with it until the last moment. According to Dr. Sa'ad al-Faqih, a widely acknowledged expert on al-Qa'ida, the jihadists have abandoned their previous tactics of targeting Westerners and the security forces in Saudi Arabia and are now focusing all their attention on the royal family. They "believe that the prevailing opinion in Saudi Arabia-and probably in the wider Muslim world-is that the royal family is infidel and deserves harsh treatment_ [and they] have overcome their fear of a secular takeover in the event of the sudden downfall of the House of Saud." According to al-Faqih, it seems that in the late 1990s, bin Laden thought that if the House of Saud were removed, the country would fall into the hands of secular forces. Al-Qa'ida has reached the conclusion that, as they learned from the Iraq theater, the sudden collapse of the regime would either invite foreign interference or lead to chaos. An American invasion would therefore provide a massive recruitment opportunity for them and a certain victory. It is of interest to note that according to al-Faqih, the local Saudi leadership has made "quite a few clumsy decisions" in the recent past and "at the operational level there is now a very tenuous link between bin Laden and his advisers and the local al-Qaeda leadership in Saudi Arabia." According to Reuven Paz, an Israeli expert on Islamist organizations, the attacks in Saudi Arabia marked an important change in the jihadist strategy and a return from the distant Afghanistan to the Arab land. This shift became even more evident after the first jihadist attacks in Sinai, on October 7, 2004, after seven years of a de facto timeout from terrorist operations conducted on Egyptian soil. In an article written by the Saudi Abu Abbas al-Aedhi, the Sinai attack is presented as the first of several forthcoming attacks in Egypt as part of a clear strategy approved by the mujahideen in Saudi Arabia, Iraq, and Egypt. The jihad in Iraq and Egypt are viewed as "the ropes to strengthen the Jihad in Arabia" The next steps should be the beginning of jihad in Yemen and Kuwait on the one hand, and the unification of the North African jihadist groups in Libya, Tunisia, Algeria, Morocco, Mauritania, and the Sudan, on the other hand. The main theme of al-Qa'ida's strategy, however, is to place the jihad groups in Saudi Arabia at the center, coordinating the Islamist activity with the two "branches" in Iraq and Egypt as part of this central goal. This strategy was devised among others by the late Yousef al-Uyeri, killed in June 2003 by the Saudi police. According to this analysis, al-Uyeri marks the shift of the younger generation of the dominant scholars of global jihad to Saudi hands and should be viewed as the architect of global jihad in Iraq. Another jihadist analysis, seemingly based upon the 1601 page book on jihad by Abu Mus'ab al-Suri relates to the Sinai attacks of October 2004, the consequent Cairo (April 2005) attacks, and the Sharm al-Shaykh (July 2005) attacks. According to al-Suri the most important jihadist target in this phase must be attacks against tourists. The attacks in Sinai were, therefore, a highly successful example of this strategy, both against the Egyptian government and in terrorizing the Westerners. This also seems to be an attempt to identify new fronts in the Arab world-apart from Iraq-to conduct the struggle. Paz believes there is a high likelihood that we are facing two separate strategies and even two different competing parties of global jihad, with Zarqawi in the Iraqi arena and al-Suri stationed in other parts of the Arab world. Furthermore, it is important to note that the Saudi involvement in the Islamist insurgency in Iraq is significant, as they represent some 61 percent of Islamists killed and some 70 percent of Arab suicide bombers. It seems that thus far, Saudis are not only the group most affected by the insurgency in Iraq, but also help feed it. One significant explanation for this could be the Wahhabi hostility towards the Shi'a, who are perceived as infidels, and the notion of the need to support the Sunni minority in Iraq. Apparently, the new strategy proposed by the new ideologues of global jihad is implemented on the ground. The Brigades of Martyr Abdulaziz al-Moqrin, a previously unknown group apparently named for a Saudi al-Qa'ida leader killed in a 2004 shootout with security forces, issued a website statement threatening to carry out further attacks in Kuwait. Clear Saudi ties also have emerged in militant crackdowns in the Gulf island state of Bahrain. In 2004, at least six Bahrainis were arrested on suspicion of planning to bomb government buildings and foreign interests and collaborating with foreign terrorist groups. In January 2005, Omani authorities arrested at least 100 Islamic extremists suspected of planning to carry out attacks at a popular shopping and cultural festival. Until his demise in Afghanistan in the winter of 2001/2 bin Ladin gave Palestine low priority. For him, the heart of the matter was the US presence on the holy soil of Saudi Arabia, which he saw as the bridgehead of a corruptive non-Muslim culture. Throughout bin Ladin's public statements and declarations is one fundamental and predominant strategic goal: the expulsion of the American presence-both military and civilian-from Saudi Arabia and the entire Gulf region. Bin Ladin and the WIF he created did not forget what they saw as crimes and wrongs done to the Muslim nation: "the blood spilled in Palestine and Iraq.... the massacre of Qana, in Lebanon_ and the massacres in Tajikistan, Burma, Kashmir, Assam, the Philippines, Fatani, Ogadin, Somalia, Eritrea, Chechnia, and in Bosnia-Herzegovina." Yet it is worth noting that the Palestinian issue was given no special prominence. According to Abdel-Bari Atwan, editor of the London-based al-Quds al-Arabi, bin Ladin "has been criticized in the Arab world for focusing on such places as Afghanistan and Bosnia-Herzegovina, and [he] is therefore starting to concentrate more on the Palestinian issue." Following the demise of Afghanistan, the hiding al-Qa'ida leaders bin Ladin and Zawahiri mentioned Palestine more and more as a top priority and in parallel there was a sharp increase in attacks by jihadist groups against Jewish and Israeli targets. The first major attack after the war was the suicide bombing on April 11, 2002 outside a historic synagogue in Djerba, Tunisia. The 16 dead included 11 Germans, one French citizen, and three Tunisians. Twenty-six German tourists were injured. The Islamic Army for the Liberation of the Holy Sites claimed responsibility. On May 16, 2003, 15 suicide bombers attacked five targets in Casablanca, Morocco, killing 43 persons and wounding 100. The targets were a Spanish restaurant, a Jewish community, a Jewish cemetery, a hotel, and the Belgian Consulate. The Moroccan Government blamed the Islamist al-Assirat al-Moustaquim (The Righteous Path), but foreign commentators suspected an al-Qa'ida connection. On November 15, 2003, two suicide truck bombs exploded outside the Neve Shalom and Beth Israel synagogues in Istanbul, killing 25 persons and wounding at least another 300. The initial claim of responsibility came from a Turkish militant group, the Great Eastern Islamic Raiders' Front, but Turkish authorities suspected an al-Qa'ida connection. On November 28, 2002, at least 15 people died in the first suicide attack by al-Qa'ida against an Israeli target: an Israeli-owned hotel in Mombassa, Kenya. A large part of the Paradise Hotel was reduced to rubble and nine Kenyans and three Israelis were killed. A parallel attempt to fire two missiles at an Israeli holiday jet (an Arkia airline plane-a Boeing 757 carrying 261 passengers) that had taken off from the city's airport failed. The reason for this sudden interest in Jewish and Israeli targets was most likely the result of al-Qa'ida and associates groups' attempts to bandwagon what was considered at that stage a very successful violent al-Aqsa intifada by Hamas, Palestinian Islamic Jihad (PIJ), and other Palestinian groups. On the one hand, it permitted them to claim their support to the Palestinian people, but at the same time it created an anti-Jewish and anti-Israeli terrorist campaign which would attract more solidarity and support from the Arab and Muslim masses and possibly attract more young recruits to their ranks. More recently in August 2005, four Israeli cruise ships carrying a total of 3,500 tourists scheduled to dock in the Mediterranean Turkish resort of Alanya were rerouted to the island of Cyprus by the Israeli authorities due to fear of a terrorist attack. A Syrian citizen named Louai Sakra was arrested for plotting to slam speedboats packed with explosives into the cruise ships filled with Israeli tourists. A new radical Muslim terrorist group with close ties to al-Qaida in Afghanistan, Pakistan, and Iraq, has started operating in the Gaza Strip, according to PA security officials. Jundallah, or "Allah's Brigades," consists mostly of former Hamas and Islamic Jihad members. It launched its first attack on IDF soldiers near Rafah in mid-May 2005. The group is especially active in the southern Gaza Strip. Jundallah's emergence in the Gaza Strip confirms suspicions that al-Qa'ida has been trying to was trying to establish itself in the area before Israel's planned withdrawal. ... In the context of the Islamic Jihad by our mujahideen brothers of al-Qa'ida's World Organization against the Jews and Crusaders. We declare that the Brigades are not a new or passing organization on the land of Palestine, but a [true] believer spirit that urges on the mujahideen to make themselves into a single rank. Some observers, however, believe that the new group is merely a split from Fatah or an operational pseudonym that will disappear after a few uses, as was the case with the Tanzim Jundallah group. In September 2005, Mahmoud Waridat, a West Bank Palestinian arrested in July the same year, was charged by IDF prosecutors with undergoing training at an al-Qa'ida camp in Afghanistan in the summer of 2001, though it was said the defendant later declined an offer to join bin Ladin's global network. A leaflet distributed in Khan Yunis in October 2005 by al-Qa'ida Jihad in Palestine announced that the terrorist group had begun working towards uniting the Muslims under one Islamic state, the only way for Muslims to achieve victory over their enemies. The leaflet is the latest indication of al-Qa'ida's effort to establish itself in the Gaza Strip after the Israeli withdrawal from the area. On the eve of the disengagement, a number of rockets were fired at the former settlements of Neveh Dekalim and Ganei Tal. An announcement claiming responsibility on behalf of al-Qa'ida members in the Gaza Strip was made by three masked gunmen who appeared in a videotape. Al-Qa'ida's new on-line television channel branded PA chairman Mahmoud Abbas a "collaborator with the Jews," accusing him of assisting Israel in its war on Hamas. Nine Katyusha rockets were fired from Lebanon into Israel on the night of December 27, 2005. Four rockets hit the town of Kiryat Shmona, another hit the Western Galilee town of Shlomi, and four landed in open areas. IDF intelligence estimated that the Popular Front for the Liberation of Palestine-General Command, headed by Ahmed Jibril-was responsible for the Katyusha fire, most likely in coordination with Hizballah. As a result, on December 28, 2005, Israel Air Force fighter jets fired two missiles at a PFLP-GC training base at Na'ameh, about seven kilometers south of Beirut, slightly wounding two fighters. [After] careful planning and intelligence gathering, a group of al-Tawheed lions and Al-Qaida operatives put their faith in Allah and launched a new attack on the Jewish state_ [with] ten Grad rockets from Muslim territory of Lebanon toward selected targets in the northern part of the Jewish state_. This blessed attack was carried out by the mujahideen in the name of Mujahid Shaykh Usama Bin Laden, the commander of al-Qa'ida_ With the help of Allah, what is yet to come will be far worse." Sources in the IDF said it was difficult to determine the reliability of the announcement. It should be noted that there is an al-Qa'ida affiliate in Lebanon, Usbat al-Ansar, comprised of radical Sunni Palestinians from the Ayn al-Hilwah refugee camp in southern Lebanon. On August 19, 2005 an al-Qa'ida affiliate calling itself the Abdallah Azzam Battalions fired three Katyusha rockets from Aqaba, Jordan. One of the rockets landed near Eilat's airport, the second narrowly missed an American ship in the Aqaba harbor, and another hit a group of Jordanian soldiers. Although it is possible that Hizballah or one of its Palestinian allies were behind the December 27, 2005 bombing of northern Israel, the claiming of responsibility by Zarqawi's al-Qa'ida Committee in Mesopotamia should be taken seriously. It is possible that the stage of al-Qa'ida and Iran refraining "from harming each other" has already passed and the moment has arrived when the Iranian regime, in coordination with Assad's regime or Hizballah, have decided to give a free hand to al-Qa'ida to do their "dirty work." Although the vast majority of Muslims in Europe are not involved in radical activities, Islamist extremists and vocal fringe communities that advocate terrorism exist and reportedly have provided cover for terrorist cells. It must be stressed that there was a serious Islamist terrorist threat in Europe long before 9/11. On December 24, 1994, four terrorist members of the Algerian GIA hijacked Air France flight 8969 at Algiers airport bound for Paris. The terrorists assassinated an Algerian policeman. In addition, during the intense standoff, authorities learned that the aircraft was laden with more than twenty sticks of dynamite and that the GIA planned to fly the plane into the Eiffel Tower in Paris, blowing it up. The plane was diverted to the Marseille International Airport and there French commandos managed to overcome the terrorists. In the 1990s, the NATO, EU, and US decision to support Bosnia's independence practically neutralized bin Ladin's plan to use the Bosnian front-and later Kosovo and Albania-to penetrate Europe. Still, some ex-mujahideen remain in Bosnia and seem recently to be active. In December 2000, the arrest of four suspected al-Qa'ida members by German police foiled a plot to attack the Strasbourg Cathedral. An Islamist preacher named Abu Qatada was arrested for the attack but was released on a lack of evidence. December is the twelfth and last month of the year in the Gregorian Calendar and one of seven Gregorian months with the length of 31 days. ... This article is about the year 2000. ...Also, in September 2001, US, European, and Middle Eastern efforts foiled a plot to blow up the US embassy in Paris. The same month, a plot was uncovered to bomb a NATO air base in Kleine Brogel, Belgium, home to 100 US military staff. Germany (the Hamburg cell) and Spain (the wide infrastructure in Madrid and some provincial cities) were identified as key logistical and planning bases for the September 11, 2001 attacks on the United States. Moreover, the Milan Islamic Center in Italy has served since the mid-1990s as a base and support for several Egyptian, Algerian, Tunisian and Moroccan al-Qa'ida affiliated cells, which did not reach the stage of conducting terrorist attacks before their arrests. The March 11, 2004 attack on the trains in the Atocha station in Madrid was the first successful operation in Europe by an al-Qa'ida affiliated group. It was followed by the July 7 and 23, 2005 series of four suicide bombings in the London underground, the second one a failed operation. The March 2004 terrorist bombings in Madrid have been attributed to an al-Qa'ida-inspired group of North Africans. UK authorities suspect the four young British nationals who carried out the July 7, 2005 terrorist attacks on London had ties to al-Qa'ida as well. that the war is only a good pretext. The goals of the Islamists are much larger and they are not willing to compromise. And the Islamists have no intentions of stopping after one victory, and most likely not stop before the liberation of Andalusia from Spanish "occupation." Since the war in Iraq, attacks and threats have also targeted the "minor" US allies in the framework of the international coalition: Poland and Norway, South Korea, Italy, and Denmark. Moreover, police operations in Germany, Italy, Ireland, and the UK have led to the arrest of terror suspects and the dismantling of an Islamic network centered in Italy that recruited fighters for the insurgency in Iraq. This network, possibly involving Ansar al-Islam in Italy and al-Tawhid in the UK and Germany, also had a foothold in Norway, France, Spain, and the Netherlands. The preferred option and long-term goal of al-Qa'ida is therefore not a concept different from "transnationalism." The Muslim world is not, nor has it ever been, defined wholly or mainly in terms of the umma or transnational linkages and identities. To be sure, forms of solidarity over Muslim-related political conflicts and issues-such as Palestine, Kashmir, and now Iraq-do exert a hold on many people and inspire some to radical activism. According to a serialized book published in July 2005 by a Jordanian journalist, the future strategy of Abu-Mus'ab al-Zarqawi is based on expanding the conflict with the United States and Israel and involving new parties in it. Simultaneously, a broad-based Islamic jihadist movement will assume responsibility for changing the circumstances that have long prevailed in the region and for establishing an Islamic caliphate state in seven stages with Iraq as its base. Turkey, which is located north of Iraq, is viewed as the most important Islamic state because of its great economic and human resources and significant strategic location. Abu-Mus'ab and al-Qa'ida believe that Turkey lacks self-determination and freedom because "the Jews of Dunma" control the army and the economy and are the real powerbrokers in the country. Therefore, Turkey's return to the ranks of the nation "will not happen unless a powerful strike is dealt to the Jewish presence in that country." Al-Qa'ida's current strategy is to infiltrate Turkey slowly and postpone major operations there until major gains are made in Iraq. Iran is the second country that al-Qa'ida seeks to involve in this conflict. Iran expects that the United States and Israel will strike a number of nuclear, industrial, and strategic Iranian facilities. Abu-Mus'ab thinks that the US-Israeli confrontation with Iran is inevitable and could succeed in destroying Iran's infrastructure. Accordingly, Iran is preparing to retaliate by using the powerful cards in its hands. The area of the war will expand, pro-US Shi'a in Iraq and Afghanistan will suffer embarrassment and might reconsider their alliances, and this will provide al-Qa'ida with a larger vital area from which to carry out its activities. However, according to al-Faqih, "al-Qaeda secretly thinks it might have made a mistake by appointing Zarqawi as its leading representative in Iraq," because he is "too decisive as a commander" and is driven by arrogance. According to some rumors, "the jihadi circles are trying to reach bin Laden in order to convince him to remove Zarqawi as the local al-Qaeda commander in Iraq." The jihadist leaders in Iraq are not at all happy with Zarqawi's conduct and "begrudge his arrogance and recklessness." Basing himself on Zawahiri's letter to Zarqawi, al-Faqih concludes that Zawahiri remains al-Qa'ida's main strategist. It is clear from this succinct presentation and from the events on the ground that the current situation in the Middle East is both complex and volatile and that developments in one country or region are influencing neighboring countries and conflicts. Therefore, the war on terrorism will require a long and intricate campaign. The danger of the Islamist networks can be neutralized in the long run only by preventing the formation of a "liberated fundamentalist territory"-the concept of Ayman Zawahiri-in Iraq, Saudi Arabia, Pakistan, Central Asia, Indonesia or elsewhere in the Muslim world. The existing danger is not that of a united World Islamist Front and its victory, but rather of a politically and socially destabilized Middle East and of an increasingly paranoid and undemocratic global society (especially if WMD terrorism succeeds). On the strategic-military level, only political, intelligence, and operational cooperation between the great international players-the United States, Europe, Russia, China, and India-can overcome this dangerous perspective. On the ideological and political level, the radical trends in the Muslim societies can be defeated only by the moderate Muslims. Muslims themselves can and must propagate an understanding of the "right" Islam, and thereby discredit extremist ideology. Yet to accomplish this task requires the understanding and support of like-minded individuals, organizations and governments throughout the world. Our goal must be to illuminate the hearts and minds of humanity, and offer a compelling alternate vision of Islam, one that banishes the fanatical ideology of hatred to the darkness from which it emerged. *Ely Karmon is Senior Research Scholar at The Institute for Counter-Terrorism (ICT) and also Research Fellow at The Institute for Policy and Strategy (IPS) at The Interdisciplinary Center (IDC) in Herzliya, Israel. 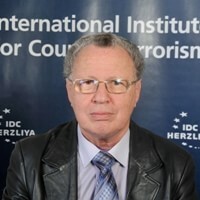 He lectures on terrorism and guerrilla in modern times at IDC, at the IDF Military College, and at the National Security Seminar of the Galilee College. Karmon is the author of Coalitions of Terrorist Organizations. Revolutionaries, Nationalists and Islamists (Leiden, Boston: Brill Academic Publishers, 2005). Fred Halliday, "A Transnational Umma: Reality or Myth?," October 7, 2005, at: http://www.opendemocracy.net/globalization/umma_2904.jsp. Ayman al-Zawahiri, Knights under the Prophet's Banner, published as a serialized book by the London Al-Sharq Al-Awsat. English translation available at: www.fas.org/irp/world/para/ayman_bk.html. US Department of State, Office of the Coordinator for Counterterrorism, Country Reports on Terrorism 2004, Department of State Publication 11248, April 2005, pp. 61-62. April 11, 2002, a blast at Tunisian synagogue kills 17 people. A fuel tanker is blown up outside a synagogue on the Tunisian island of Djerba killing 19 people, including 14 German tourists. An al-Qa'ida spokesman later says the organization was behind the suicide attack. October 12, 2002, bomb attacks on Bali nightclubs kill 202. Two bombs rip through a busy nightclub area in the Balinese town of Kuta killing 202 people, most of them foreign tourists. The Indonesian authorities believe the attacks were carried out by the South East Asian militant network Jemaa Islamiah which is said to have links to al-Qa'ida. November 28, 2002, Israeli targets come under attack in Kenya. Sixteen people including three suicide bombers are killed in a blast at an Israeli owned hotel in Mombassa. A missile fired at an Israeli plane misses its target. A message on a website purporting to come from al-Qa'ida says the group carried out the attack. May 12, 2003, dozens killed in Saudi bombings. At least 34 people are killed in a series of bomb attacks in Saudi Arabia's capital Riyadh. The targets were luxury compounds housing foreign nationals and a US Saudi office. Washington and Riyadh say al-Qa'ida is the prime suspect. It is the first in a string of attacks over successive months in Saudi Arabia. May 16, 2003, Morocco is rocked by suicide attacks. Bomb attacks in Casablanca kill 45 people including 12 attackers. Targets include a Spanish restaurant, a five star hotel, a Jewish community center, and the Belgian consulate. Four men later sentenced to death for the attacks are said by the Moroccan authorities to be members of the Salafia Jihadia widely believed to be linked to al-Qa'ida. December 15, 2003, suicide bombers hit two Turkish synagogues. At least 23 people are killed and more than 300 injured in two devastating suicide attacks on synagogues in Istanbul. The government blames al-Qa'ida for the attacks. December 20, 2003, two bomb attacks on British interests in Turkey. Attacks on the British Consulate and the HSBC bank offices in Istanbul leave 27 people dead and more than 450 wounded. There are separate claims of responsibility from two allegedly al-Qa'ida connected groups. See BBC News, Timeline: Al-Qaeda, at: http://newsvote.bbc.co.uk/mpapps/pagetools/print/news.bbc.%20co.uk/1/hi/world/3618762.stm. "Saudis arrest suspects in Riyadh bombings," ICT website, May 28, 2003, at: http://www.ict.org.il/Article.aspx?ID=1543. Ayman al-Zawahiri audiocassette, October 9, 2002; September 2003: Parts of the 105-minute tape broadcast by al-Jazeera satellite television showed Bin Ladin with al-Zawahiri, who urged supporters to bury Americans in "the graveyard of Iraq." Although bin Ladin had not appeared on a videocassette for many months, remaining silent, he allowed al-Zawahiri to speak. As of May 2005 the list included, among others: Ramzi bin al-Shibi (the reputed recruiter for the 9/11 attacks); Mohammed Atef, Abu Zubaydah, and Khaled Shaykh Mohammad (all senior operational planners); Abd al-Rahim al-Nashirih (bin Ladin's alleged point man on the Arabian Peninsula and chief organizer for maritime attacks such as the USS Cole suicide strike in 2000); Riduan Isamuddin (also known as Hambali, al-Qa'ida's main link to Southeast Asian militant groups and the accused mastermind of the 2002 Bali attacks in Indonesia); Ahmed Khalfan Ghilani (one of the FBI's 22 most wanted terrorists, believed to be a key figure behind the 1998 U.S. embassy attacks in Kenya and Tanzania); Abu Faraj al-Libbi (thought to be al-Qa'ida's third most senior leader in 2005 and main coordinator for operations in Pakistan); Haitham al-Yemeni (described as a central figure in facilitating the international dissemination of jihadist communications and supplies). List taken from Peter Chalk, Bruce Hoffman, Robert Reville, Anna-Britt Kasupski, Trends in Terrorism: Threats to the United States and the Future of the Terrorism Risk Insurance Act, RAND Center for Terrorism Risk Management Policy, 2005. Two bin Ladin supporters developed this critical analysis of Muslim governments in their articles. They present the Arab League and the Muslim Conference as "two paralyzed associations." Moreover, Arab Islamic movements are also criticized, and the weak leadership of the Muslim Brotherhood, for instance, was compared with the strong figures of Hassan al-Bana and Sayyid Qutb. B. Raman, "The Iraq War & Terrorism," South Asia Analysis Group, Paper no. 647, March 30, 2003. Iraq Report, Vol. 6, No. 10, March 14, 2003. John F. Burns, "Iraqis Threatening New Suicide Strikes against U.S. Forces," NYT, March 30, 2003. "Al-Qa'ida on the Fall of Baghdad," MEMRI Special Dispatch-Jihad and Terrorism Studies, No. 493, April 11, 2003. Ze'ev Schiff and Nathan Guttman, "Thousands cross Syrian border to fight for Iraq," Haaretz, April 1, 2003. See also Jonathan Schanzer, "Foreign Irregulars in Iraq: The Next Jihad?," Analysis of Near East Policy from the Scholars and Associates of The Washington Institute, PolicyWatch No.747, April 10, 2003. On the lack of planning for the immediate aftermath of the war see Bob Woodward, Plan of Attack (London: Simon & Schuster, 2004), p. 413. See Anthony H. Cordesman, with the assistance of Patrick Baetjer, Iraq's Evolving Insurgency, Center for Strategic and International Studies, Working Draft: Updated as of June 23, 2005. Cordesman gives an in-depth analysis of the characteristics of the Iraqi insurgency and the strategic and tactical errors of the Bush Administration in dealing with it. Cordesman, Iraq's Evolving Insurgency, pp. 11-12. For an in-depth analysis of his career see Nimrod Raphaeli, "The Sheikh of the Slaughterers: Abu Mus'ab Al-Zarqawi and the Al-Qa'ida Connection," MEMRI Inquiry and Analysis Series, No. 231, July 1, 2005. King Abdallah of Jordan told the press that in 2002, Jordan had asked Iraq to extradite al-Zarqawi following the murder of the U.S. diplomat Lawrence Foley, but the Saddam regime had ignored the request. Most agree that al-Zarqawi was definitely in Iraq at the end of 2002 and that he was given shelter by the terrorist group Ansar al-Islam (see below), which operated from northern Iraq. Ibid. Ulrich Schneckener, "Iraq and Terrorism: How Are ' Rogue States' and Terrorists Connected?," Stiftung Wissenschaft und Politik Comments, March 2003. Kenneth Katzman, "Iraq : U.S. Regime Change Efforts, the Iraqi Opposition, and Post-War Iraq," Congressional Research Service Report, March 17, 2003. Raphaeli, The Sheikh of the Slaughterers. See Anthony H. Cordesman, New Patterns in the Iraqi Insurgency: The War for a Civil War in Iraq, Center for Strategic and International Studies, Working Draft, Revised: September 27, 2005. Reuven Paz, "Arab Volunteers Killed in Iraq: An Analysis," Project for the Research of Islamist Movements (PRISM) Series of Global Jihad, Vol. 3, No. 1 (March 2005). See Raphaeli, The Sheikh of the Slaughterers. See Reuven Paz, "Global Jihad and the Sense of Crisis: al-Qa'idah's Other Front," PRISM Occasional Papers, Vol. 1, No. 4 (March 2003), at: www.e-prism.org/pages/4/index.htm. Reuven Paz, "Hizballah or Hizb al-Shaytan? Recent Jihadi-Salafi Attacks against the Shiite Group," PRISM Occasional Papers, Vol. 2, No. 1 (February 2004), at: http://www.e-prism.org/images/PRISM_no_1_vol_2_-_Hizbullah_or_Hizb_al-Shaytan.pdf. See National Terror Alert, at: http://www.nationalterroralert.com/updates/index.php?p=297. "Communiqu? from Al-Tawheed wal-Jihad Movement (Abu Musab al-Zarqawi) in Iraq ," October 17, 2004, at http://www.globalterroralert.com/zarqawi-bayat.pdf. "Zarqawi's Pledge of Allegiance to al-Qaeda: From Mu'asker al-Battar, Issue 21," Translation by Jamestown Foundation Researcher Jeffrey Pool, Terrorism Monitor, Vol. 2, No. 24, December 16, 2004. Islamist sources in Britain criticized bin Ladin's designation of Zarqawi as leader of the group, because it was smaller than other terrorist organizations operating in Iraq, such as Jaysh Ansar al-Sunna or al-Jaysh al-Islami. See Raphaeli, The Sheikh of the Slaughterers. Nimrod Raphaeli, "Iraqi Elections (III): The Islamist and Terrorist Threats," MEMRI Inquiry and Analysis Series - No. 202, January 18, 2005. See Ayman al-Zawahiri, Knights under the Prophet's Banner, published as a serialized book by the London al-Sharq al-Awsat, the English translation at: http://www.fas.org/irp/world/para/ayman_bk.html. "Letter from al-Zawahiri to al-Zarqawi," ODNI News Release No. 2-05, October 11, 2005, at http://www.dni.gov/letter_in_english.pdf. The Office of the Director of National Intelligence released the letter dated July 9, 2005, obtained during counterterrorism operations in Iraq. See Y.Yehoshua, "Dispute in Islamist Circles over the Legitimacy of Attacking Muslims, Shi'a, and Non-combatant Non-Muslims in Jihad Operations in Iraq: Al-Maqdisi vs. His Disciple Al-Zarqawi," MEMRI Inquiry and Analysis Series - No. 239, September 11, 2005. "The [collateral killing] is justified under the principle of dharura [overriding necessity], due to the fact that it is impossible to avoid them and to distinguish between them and those infidels against whom war is being waged and who are the intended targets. Admittedly, the killing of a number of Muslims whom it is forbidden to kill is undoubtedly a grave evil; however, it is permissible to commit this evil _ indeed, it is even required _ in order to ward off a greater evil, namely, the evil of suspending Jihad." See "Abu Mus'ab Al-Zarqawi: Collateral Killing of Muslims is Legitimate," MEMRI, Special Dispatch, No. 917, June 7, 2005. Yehoshua, "Dispute in Islamist Circles over the Legitimacy of Attacking Muslims, Shi'a, and Non-combatant Non-Muslims in Jihad Operations in Iraq." "Sunni Sheikhs and Organizations Criticize Al-Zarqawi's Declaration of War Against the Shi'ites," MEMRI Special Dispatch Series, No.1000, October 7, 2005. According to the "Declaration of War against the Americans Occupying the Land of the Two Holy Places"(its full title), "the latest and the greatest of [the] aggressions, incurred by the Muslims since the death of the Prophet_ is the occupation of the land of the two Holy Places-the foundation of the house of Islam, the place of the revelation, the source of the message and the place of the noble Ka'ba, the Qiblah of all Muslims-by the armies of the American Crusaders and their allies." The declaration is presented as the first step in the "work" of "correcting what had happened to the Islamic world in general, and the Land of the two Holy Places in particular.... Today.... the sons of the two Holy Places, have started their Jihad in the cause of Allah, to expel the occupying enemy out of the country of the two Holy places." See Ely Karmon, "Terrorism a la Bin Ladin is not a Peace Process Problem," PolicyWatch, No. 347, The Washington Institute for Near East Policy, October 1998. Cordesman and Obaid claim that the Kingdom was the first target of al-Qa'ida when in November 1995, the US-operated National Guard Training Center in Riyadh was attacked, leaving five Americans dead. This subsequently led to the arrest and execution of four men, purportedly inspired by Usama bin Ladin. However, bin Ladin who denied involvement praised the attack (see Washington Post, August 23, 1998) and according to other analysts the terrorists were inspired by the Jordanian jihadist ideologue al-Maqdasi. See Anthony H. Cordesman and Nawaf Obaid, "Al-Qaeda in Saudi Arabia: Asymmetric Threats and Islamist Extremists," Center for Strategic and International Studies, Working Draft: Revised January 26, 2005. Ibid. Again according to Cordesman and Obaid, at the beginning, al-Ayeri was the chief of al-Qa'ida in the Arabian Peninsula and reported directly to bin Ladin (al-Ayeri's was the only regional al-Qa'ida operation to report directly to OBL). Al-Ayeri's lieutenants, in turn, reported directly to him. They were responsible for setting up five autonomous cells focusing exclusively on operations within Saudi Arabia. See Mahan Abedin, "New Security Realities and al-Qaeda's Changing Tactics: An Interview with Saad al-Faqih," Spotlight on Terror, Jamestown Foundation, Vol. 3, No. 12 (December 15, 2005). Dr. Saad al-Faqih heads the Saudi opposition group, Movement for Islamic Reform in Arabia (MIRA). Reuven Paz , "From Riyadh 1995 to Sinai 2004: The Return of Al-Qaeda to the Arab Homeland," PRISM Series of Global Jihad, Vol. 2, No. 3 (October 2004). The article, entitled "From Riyadh/East to Sinai," was published on several Islamist Internet forums. According to Paz, two of his Saudi associates, are trying to fill his place-Shaykh Ahmad al-Zahrani, alias Abu Jandal al-Azdi in Saudi Arabia, and Shaykh Abu Omar Seyf in Chechnya, who is the leading Islamic scholar of the Arab battalion of volunteers there. Another individual to be noted is Shaykh Hamed al-Ali, a Saudi who lives in Kuwait. The analysis was published on September 25, 2005 by a known al-Qa'ida supporter, nicknamed Abu Muhammad al-Hilali. It appears to be the first analysis of this kind to be based on the 1601 page book on Jihad by Abu Mus'ab al-Suri which was published via the internet in January 2005. See Reuven Paz, "Al-Qaeda's Search for new Fronts: Instructions for Jihadi Activity in Egypt and Sinai," PRISM Occasional Papers, Vol. 3, No. 7 (October 2005). According to Paz, al-Suri is probably the most talented combination of a scholar and operative of global jihad. He was one of the chief al-Qa'ida explosive trainers in Afghanistan, but also gave many lectures about jihadist strategy, religion, and indoctrination. Many of his lectures from Afghanistan are posted on his web site in the form of video and audiotapes, and much of the material there appears in his monumental book. His call for a "Global Islamist Resistance" could be part of global jihad, but also a call for a new form of al-Qa'ida loyal to the doctrines of Abdallah Azzam, but not necessarily to the Saudi form of jihadist Tawhid. Interestingly, al-Suri has a European background. He is a Spanish citizen as a result of marriage, and lived in the 1990s in Spain and London. He is well familiar with the European arena and Muslim communities there, primarily that of North Africans. Ibid. Reuven Paz, "Arab Volunteers Killed in Iraq: An Analysis," PRISM Series of Global Jihad, Vol. 3, No. 1 (March 2005). 12,000 US civilians live in Koweit, while 25,000 US troops are based in there, using it as a launch pad for operations in Iraq. See Robin Gedye, "Soldiers in 'anti-US plot' held by Kuwait," Daily Telegraph, January 15, 2005. Sean Rayment and Peter Zimonjic, "One dead as blast demolishes Qatar theatre packed with westerners," Daily Telegraph, March 20, 2005. Paul Garwood, "Terror wave spreads across Mideast, raising concerns over regional links," Associated Press, February 1, 2005. Karmon, "Terrorism a la Bin Ladin is not a Peace Process Problem." See Significant Terrorist Incidents, 1961-2003: A Brief Chronology, Office of the Historian, Bureau of Public Affairs, U.S. Department of State, March 2004, at http://www.state.gov/r/pa/ho/pubs/fs/5902.htm. Khaled Abu Toameh, "Al-Qaida-linked terrorists in Gaza," The Jerusalem Post, May. 20, 2005. Stephen Ulph, "Al-Qaeda expanding into Palestine?" Terrorism Focus, Jamestown Foundation, Vol., 2, No. 15, August 5, 2005. "IDF prosecutors charge West Bank Palestinian with Al-Qaida link," Reuters, September 8, 2005. Khaled Abu Toameh, 'Al-Qaida raises its head in Gaza," Jerusalem Post, October 10, 2005. See Amos Harel, 'Iraq al Qaeda claims Tuesday's missile attack on northern Israel,' Haaretz, December 29, 2005. See the Communique at http://www.globalterroralert.com/pdf/1205/zarqawi1205-9.pdf. "Letter from al-Zawahiri to al-Zarqawi." See "Air France Flight 8969" at: http://encyclopedia.thefreedictionary.com/Air+France+Flight+8969. See "El n?mero de presos por terrorismo isl?mico en Espa?a ha crecido un 59% en el 2005," Barcelona La Vanguardia, December 25, 2005. Fuad Husayn, The Second Generation of Al-Qa'ida (Part 13), a serialized book on Al Zarqawi and Al-Qa'ida published by the London al-Quds al-'Arabi, July 11, 2005. See also Yassin Musharbash, "What al-Qaida really wants," Spiegel Online, August 12, 2005, at: http://service.spiegel.de/cache/international/0,1518,369448,00.html. See See Mahan Abedin, "New Security Realities and al-Qaeda's Changing Tactics: An Interview with Saad al-Faqih,"